One of the most influential figures of Scottish snooker will not be forgotten when the East of Scotland Amateur Snooker & Billiards Championships both get under way at the Edinburgh Corn Exchange later this month. 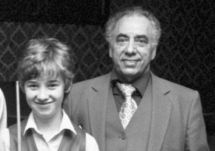 Bert Demarco, a four-times Scottish billiards champion and seven-times East of Scotland snooker champion, died last year at the age of 87. He retired from the circuit in 1993 but his influence was most significant off the table, where he served for 25 years as honorary chairman of the East of Scotland Snooker Association. Kenny Baird, secretary of the East of Scotland Snooker Association, said: “It will be tough without Bert as he has been the main reason for the success of the East of Scotland events for many years. However, the Demarco family are keen that the events continue so we will be doing our best” In commemoration of Demarco’s efforts, the Matchroom at the Corn Exchange has been renamed “The Bert Demarco Matchroom”. 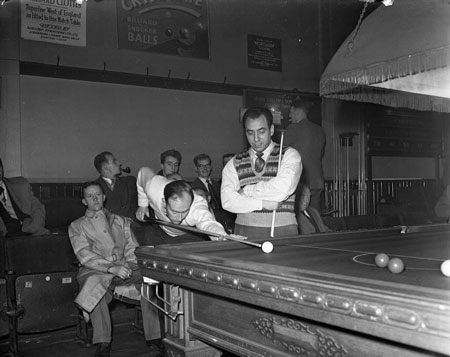 Stephen Hendry pictured with Bert was a previous competitor in the tournament. Corstorphine’s Jamie Jenkins will defend his billiard title which he claimed after a nail-biting victory over Edinburgh’s Louis Knowles last season. The snooker event is also sure to be competitive despite Bobby Cruickshanks from Perth not defending his title and new professionals Michael Leslie and Scott Donaldson no longer eligible. However, three-times champions Ross Vallance and Keith Chalmers are likely to challenge.